20 cards. Click here for a detailed guide including side-by-side comparisons for all 20 cards. 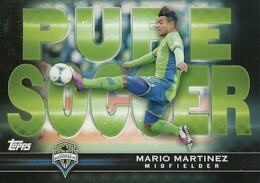 2013 Topps MLS soccer cards mark a major expansion for the card maker into the world's most popular sport. Although Topps has been producing futbol cards for collectors in Europe and other parts of the globe, it has been a long time since they've done a set primarily for a North American audience. 2013 Topps MLS boxes promise three autographs and three memorabilia cards. The 2013 Topps MLS base set has 200 cards. Not everything is available in equal quantities, though as there are both short prints and variations. Base set parallels include Blue (#/50), Gold (#/25), Black (#/10), Printing Plates and Golazo (1/1). Autographs fall under several categories. Young players are the focus of SuperDraft Autographs. Some of the league's top players are included in MLS Maestros Autographs. Both sets have four levels of numbered parallels: Gold (#/25), Black (#/10), Red (#/10) and Golazo (1/1). Past and present collide in Golden Boot Die-Cut Autographs, which highlight current and retired goal-scoring greats. Extra Time Redemptions (#/99) are redemptions good for transfer players who join the league during the 2013 season. MLS Kits come with pieces of game-used memorabilia. Blue and Red parallels are numbered to 49 and 25 respectively. Silver (#/5) parallels come with a jumbo swatch while one-of-one Gold cards come with a multi-colored jumbo swatch. Autographed Relics come with both a signature and a swatch. Parallels include Green (#/75), Gold (#/50), Black (#/25), Red (#/5) and Golazo (1/1). Black and Red cards have multi-colored pieces. Several basic inserts can be found in 2013 Topps MLS packs. 1978 Topps EPL use current players with the vintage design. This is Soccer combines action shots with a loud design. Both of these have autographed versions numbered to 25. Rivalries capture the intensity of opposing teams that share a history. Mini Cards come with a retro feel with current MLS stars. 2013 Topps MLS also has redemption cards good for MLS soccer balls. Good: Complete base set in one box, lots of autographs and memorabilia cards. Bad: Hard to tell the rookies from the veterans if you don’t follow soccer regularly. 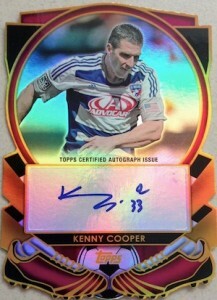 The Bottom Line: 2013 Topps MLS has a lot going on. Collectors, including those new to soccer products, should be happy to get the full set (at least we did) in one box. Inserts are plentiful and will keep set collectors wanting more. 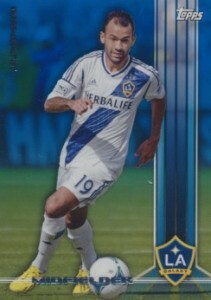 2013 Topps MLS uses a basic card design that the company is known for: glossy, borderless card fronts with excellent photos of the players in various action shots. I would have liked to see more photos of players doing the thing that make the fans cheer, like diving catches by the goal keepers and players doing headers. The background is out of focus so that the player is the subject of the photo. The inserts are pretty standard. Mini cards are similar to the ones that you can find in about any Topps product for that last few years. The photos have color, but have a washed out look to them, an effort to make them look like they came from long ago. This Is Soccer is intended to highlight players battling for the ball, making shots on goal and performing other great plays. They have a horizontal design with a black background. I didn’t like these because the photo is overpowered by the huge lettering. 1978 EPL Soccer is a throwback-style insert that has current players shown on a recycled design. Rivalries, as the name implies, focuses on team rivalries around the league. I like these for the intensity they show. The autographs in our box were both on stickers and have a prismatic effect. They're almost like a Refractor, but not as metallic or shiny. One of the things that I don't like about this type of card is that they pick up fingerprints very easily. Good photos allow for the prismatic feature to stand out. The relics and autographed relics have a soccer ball design around the swatch, making them more appealing than the standard “photo with a swatch” design you see on so many other card sets. I really like the design of these. The ball design really caught my eye. The base set is comprised of 200 cards. There are also 20 variations. The base checklist is comprised of veterans and rookies, but I wasn’t able to identify any rookies in the base set and I didn’t see them listed anywhere. I expected to see parallels, but was pleased to see that there were only a few in this product. Some rainbows can be very difficult when there are several to collect. You get what you pay for with this product. I was pleased with what came out of our box. This isn’t a high-end effort from Topps, so I felt that what we got was reasonable given the price tag. The last-second inclusion of a third autograph was definitely a good thing. Since I am a set builder, it was nice that I was able to put together a complete set and not having a stack of extras. I had a good time figuring out what was what and looking up some of the players as I haven't collected a lot of soccer cards. 2013 Topps MLS Soccer Factory Sealed HUGE 24 Pack Retail Box+AUTOGRAPH RELIC!! The collation in the boxes I just opened is terrible. I do like the 1978 cards and I did get 2 jerseys as well. Still, there is no reason to have 5 of some cards and 0 of others after opening 2 boxes in a 200 card set. Not a good-looking set. Boring graphics. 1978-style graphic design especially homley. Bad collation — I only got 74% completion off of two full boxes. Way, way too many extra sets. Upper Deck was better in every way. I opened (1) Hobby Box and put together the complete 200 card base set, (3) Autos and (3) Relic Cards. 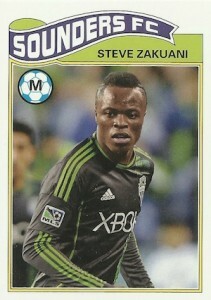 Topps has done little to change the base set look that Upper Deck MLS had. The on sticker signatures still cheapen the idea of autgraph card. However, the retro looking EPL cards and minis are a nice additions and managable sets to complete. Room for improvement next year by Topps. But don’t count on it.